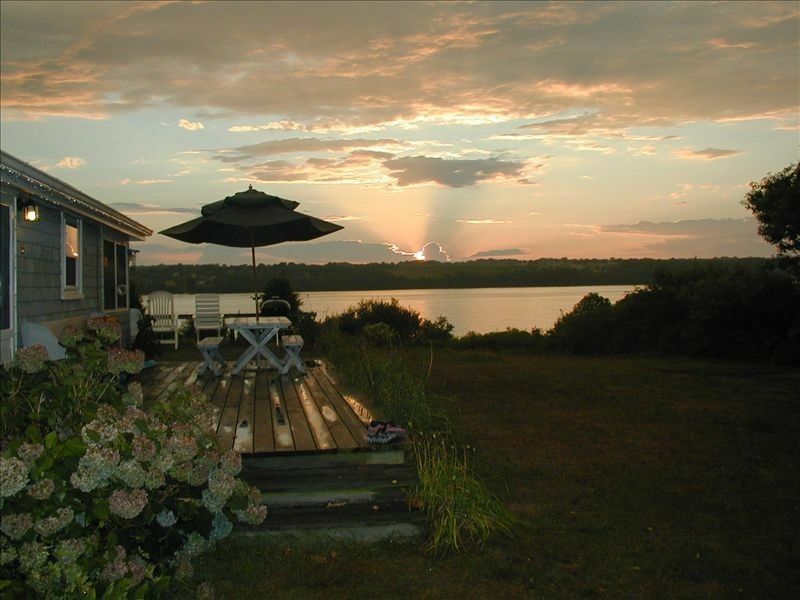 Charming cottage in a spectacular location on Fogland Point. Large wraparound deck faces the Sakonnet River and features a gorgeous panoramic ocean view. We particularly enjoy cocktails on the deck at sunset. The sunsets on Fogland Point are unusually gorgeous. The front yard leads to private rocky beach great for swimming, fishing, kayaking, shell collecting and exploring the water's edge. Located a short five minute walk from the town swimming beach (lifeguard on duty seasonally), playground, and boat launch. Fogland Point is a ideal location for kayaking, stand up paddle boarding, and is one of the best windsurfing and kiting locations in New England. This two bedroom cottage has a queen sized bed in the master bedroom, a set of bunk beds and a single bed in the child-friendly second bedroom, and a futon couch in the closed-in porch (where you can hear the sound of the water at night). Bring your own linens and food -- we provide the rest. The house is equipped with wi fi, digital cable television, DVD/VHS player and a bluetooth/mp3 player. Though the kitchen is small, it is fully equipped with microwave, coffee maker, blender, mixer, baking pans, etc. A front-loading stackable washer/dryer is located in the bathroom. The house is very kid-friendly and comes with beach toys, books, a few videos and a lot of games for family evenings or the occasional rainy day. The closed-in porch, complete with lobster lights, is great for enjoying sunsets and quiet evenings with the sounds of waves lapping on the rocky beach below. The cottage is located less than 10 minutes from Gray's Ice Cream, frequently rated best ice cream in RI. Besides Gray's there are other businesses worth exploring in historic Tiverton Four Corners, including several antique shops and galleries, a toy store, gift and home decor shops, designer clothing shops, cheese and pate' shop, bookstore, library, restaurants and more. Tour Sakonnet Vineyards, only 10 minutes away. Downtown Newport, with its mansions, sailing, restaurants, shopping, and jazz festival is only 30 minutes away. Great food abounds at local restaurants, fresh seafood markets, and country stands in both Tiverton and neighboring Little Compton. Local restaurants feature great home cooking and seafood specialties, like seafood chowder, lobster rolls, fried clams, clam cakes and homemade pies. The cottage is located a short 5 minute walk from one of the best windsurfing locations in New England. Rental equipment and private lessons are often available on the beach. According to a popular windsurfing website, "Fogland point is one of the most popular spots in the state. It is one of the windiest sites not on Cape Cod. There is a sheltered shallow cove area on the north side of the point (you can walk across except at high tide), and slightly more open sailing on the south side. Great area for all skills of sailors. Also the beach is nice, too, and not too busy. Pebbly, sandy beach, not very big waves... One of the most beautiful and scenic sailing sites also. There's a saltwater marsh, and some tidal pools with lots of sea life." The sheltered shallow cove on the north side of Fogland Point is wonderful for stand up paddle boarding. Last summer we watched a SUP yoga class moored out in the cove. Our daughters have loved playing around the marshes. When they were small they collected hermit crabs, as they grew they graduated to playing hide and seek in the marshes on surf boards and in kayaks. Our family has been vacationing here on Fogland Point since 1984. My wife and I spend 2-3 weeks here every summer and our twin daughters, now age 17, describe it as their favorite place in the whole world. Fogland Point is a treasure, with it's dozen small cottages, private dirt road, and spectacular views in every direction. Oceanfront property with gently sloping lawn leading to swimable rocky beach. Spectacular panoramic view of the wide Sakonnet River, a part of Narragansett Bay. Two window units are installed for the summer. Oceanfront: Oceanfront property with gently sloping lawn leading to swim-able rocky beach. Spectacular panoramic view of the wide Sakonnet River, a part of Narragansett Bay. Kid Friendly: Comes with beach toys, books and games. Cottage on the water, tranquil, perfect! This cottage is lovely, tucked in a quiet community yet close to so many experiences to enjoy during your week. The house is on a nice-sized property, close to others but still affording privacy for your visit. It is situated facing west so sunsets are a main event. The master bedroom is a nice size, the second bedroom a bit cramped but gives you chance to invite kids' friends. Comfortable living/dining room, porch (we did not use this as we wanted more deck time) and adequate kitchen. Great walking neighbourhood, close to Fogland Beach. I had no idea Rhode Island was so beautiful. Good communication with owners. We loved sitting under the grape arbor watching the sunset and sailboats. Perfect cottage to relax and unplug. The town is delightful and I enjoyed stopping on the side of the road to get some freshly cut sunflowers with an honors box. We happened to hit on an artist studio weekend and that was neat to explore the town and visit with the artists in the area. This year will be our 5th year staying at this cottage. Its perfect for us. Charming New England cottage overlooking the water. We can relax on the wrap around deck with morning coffee watching the sail boats go by. In the afternoon sun we can have our own happy hour under the cool grape arbor and watch more sailboats. In the evening we have dinner on the deck while watching the sun set right over the water. This cottage is perfect for a couple or a family with small children. There is a beach a short walk up the dirt road that is very safe for little ones. The area is lovely to walk in or for a bike ride. Farms, vineyard, stonewalls, blue hydrangeas will delight your view. Tiverton is an adorable town and not touristy at all which is what is desirable for us. We are so glad we came upon this listing years ago and look forward to visiting every summer. Thank you Lorraine. We love having you! This cute little cottage is situated on a cool little spit of land...surrounded by the water. A sandy beach, a shell-covered beach and a rugged rocky shore are all within steps of this cottage. Lovely indoor and outdoor spaces. Kayaking, stargazing, and biking opportunities abound. Great central location for exploration of nearby hiking trails, villages and beaches. A great place to relax and unwind. The pictures hardly do this place justice. We were so lucky to have found this spotless, bright and homey place for our first family beach vacation. The owners obviously take great pains to maintain and care for this property. The town beach is only a few minutes away on foot, although it's equally tempting to spend the days on the big deck overlooking the water. Our 1-year old daughter thoroughly enjoyed running around the little yard and playing with the little toys and games that were provided. The beach area itself is not crowded and is very quiet at night. Lots of fun to watch all the sail boats, windsurfers and kite surfers on their way up the river. Amenities, restaurants, walking trails and Gray's ice cream are all conveniently located. We would highly recommend this spot to anyone with young kids looking to have a relaxing week at the beach. We can't wait to return. We were lucky to stay in this cottage for 12 days starting on Labor Day. While small, it had everything we needed for a relaxing vacation. We have 2 young daughters, and our 2 1/2 year old had an absolute blast here. Lots of time at the beach, walking down to "the rocks" - the private rocky beach steps from the house. Coming after Labor Day, we basically had the beach and town to ourselves - the nice, quiet, relaxing time that we were looking for. The yard was perfect, view from the deck was beautiful. Every night after kids' bedtime was spent relaxing on the porch listening to the wind and the waves. The house is a perfect beach cottage, 2 bedrooms and a nice living/eating area. We cooked most nights, and the kitchen is well stocked for all meals. We tried to hit all of the area attractions and there was plenty to do. The owners were very accommodating and easy to deal with. We'd be happy to rent from them again. All in all, an idyllic, perfect beach vacation. We can't wait to return to Fogland Point!